852944 Luke Skywalker Key Chain is a Star Wars Key Chain released in 2010. 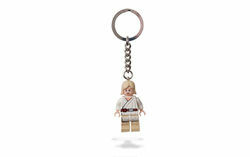 It features a Luke Skywalker Minifigure with a metal chain and key ring attached to his head. This version of Luke Skywalker was previously only available in 8092 Luke's Landspeeder, except without the chain. This is a description taken from LEGO.com. Please do not modify it. (visit this item's product page) Luke Skywalker™ guards your keys! Authentic LEGO® Star Wars™Luke Skywalker™ minifigure attached to a sturdy metal chain and loop. Facts about "852944 Luke Skywalker Key Chain"
ShopDescription Luke Skywalker™ guards your keys!